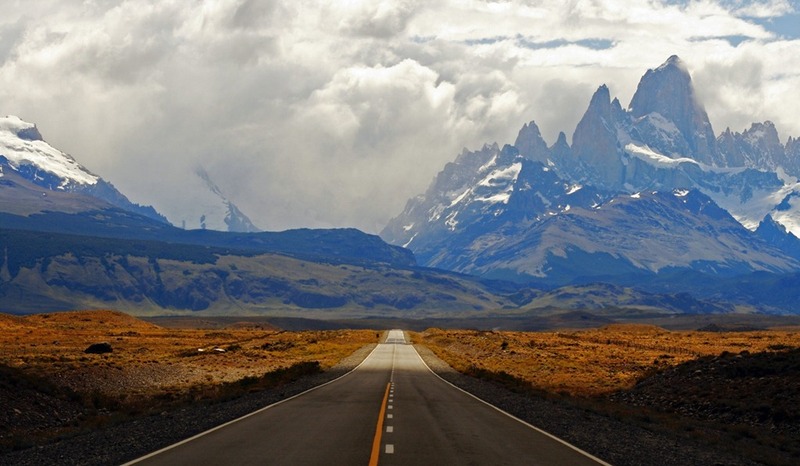 Home » Mountains , National Parks , Nature , Nature Reserve , Patagonia , Santa Cruz » The Fitz Roy is famous of impossible to huge rock walls covered with ice floes. 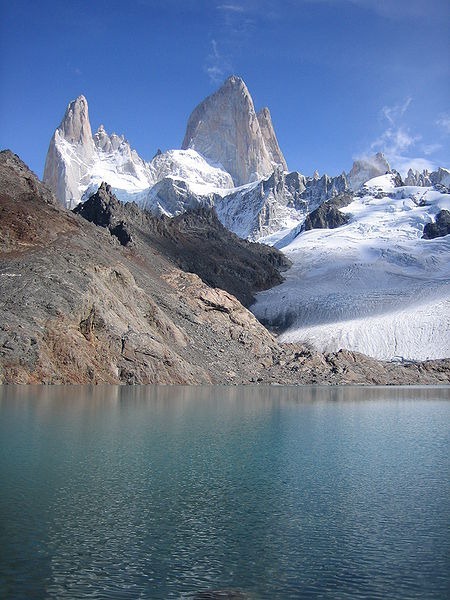 The Fitz Roy is also called Chalten, Mount smoking. So they had baptized the Indians, believing a volcano because of the fog that envelops the top. High just over three thousand meters, the Fitz Roy is famous for the enormous impossible cliffs often covered by ice floes and the prohibitive weather conditions. 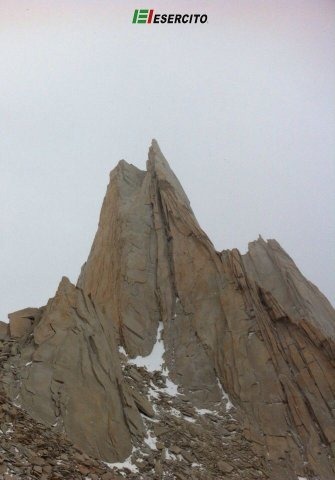 The same weather conditions that did tell Lionel Terray, the legendary French mountaineer who in February 1952 was the first, with seven companions to climb Fitz Roy: "It was the only mountain that has tested my endurance and also my morale. " Day 1 El Chalten - Campamento Poincenot. Leave El Chalten walking north on the main road RN23 to Campamento Madsen. Turn left to the obvious junction, following the path that leads gently uphill through a beautiful forest. After the fantastic views to the north on the Río de las Vueltas climb in the dense forest, and sometimes you can see the peaks on the horizon. After about 2 hours the Fitz Roy appears, all of a sudden, leaving you breathless. The trail continues to the left and go down another path (signs) to the quiet Laguna Capri in just 15 minutes. This detour is recommended; water, clear as crystal, reflecting the mountains tronano distance. Some trekkers choose to stay here, but if you want to see the Fitz Roy from the lookout at dawn we recommend the most popular (and crowded) Campamento Poincenot. Return to the main path and continue to arbustri and moorland until the signs for the shortcut (not viable) that, from the west, connecting the Fitz Roy trek with that of Cerro Torre. Our route continues on the other hand in a wide arc toward NO, sometimes through a swamp, following reports yellow for a bridge and then left through the woods to the spacious Campamento Poincenot. 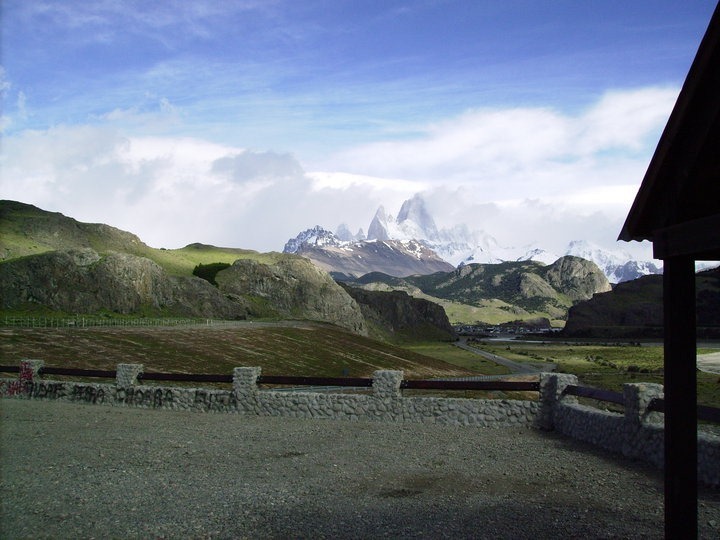 If done as a day trek, cross the camp to enjoy the view of Mount Fitz Roy and then back along the same route. Otherwise put up tent and enjoy the view. 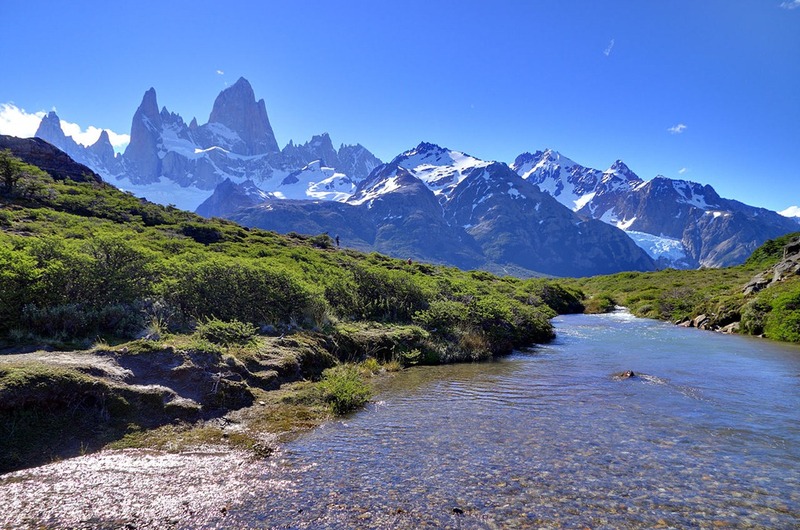 The trek from Campamento Poincenot to Laguna de Los Tres offers a spectacular view over the Fitz Roy massif; a starting early in the morning and good time will give you a sunrise to remember. Leave Campamento Poincenot before crossing a small river then, continuing to the west, a suspension bridge over the raging Rio Blanco to enter Campamento Rio Blanco, the base camp used by mountaineers. Bear left to follow the path out of the woods on the steep gravel slope. This leads, after a jump, the true and the beautiful ridge lookout with views Laguana de Los Tres, the impressive Fitz Roy massif, and the desolate steppes that stretch for hundreds of miles to the east. The contrast could not be greater. From here go back to the campsite, redo the tent and return along the uphill path to El Chalten. They say that dreams do not risognano, but when I watched the joy laughing in the eyes of Horacio and Luke, while distilling the last effort I reached over the infinite horizon of Chalten Fitz-Roy, I realized I had just realized the dream of life, their impossible dream. I looked at them in silence, at times, long, experiencing sensations and emotions more than I can contain my heart, before the wind will bring a walk even my thoughts. How time flies! Twenty years later I found myself back up there, with several companions but they were experiencing their first great and unique experience, even in that corner of the clear sky and friend intent on forging vitality and satisfaction, sensing that grandiose environment with all five the senses, almost not to notice those fleeting moments. Now the "cumbre", while the wind enveloped us from the morning with his icy gusts and intense, always trying to sneak malicious between various indecisions and our insecurities, stopped every now look further down the red rocks of the ridge Output Supercanaleta and various memories crowded my mind: my first time when sbucavo from that ridge, the other great experiences peaks in front, on the strange towers capped by curious meringue ice. Chalten ... Fitz Roy, the mountain by the two names. E 'curious gather to think about what name is more suitable for the giant granite overlooking momentum throughout Patagonia. Chalten, the mountain that smokes, because of the swirling clouds which, by covering the top often fray then fast in the sky. That is the real name, the original given by the Indians Tehuelche to that impressive mountain they believed was a volcano. And to think of it is a shame that, in full colonial era, the physical extermination, of hatred and annihilation of Indian tradition, the Perito Moreno Francisco have come to mind, unfortunately, to rename the magnificent mountain with the name of the captain the British ship Beagle. It would be really wonderful if this beautiful symbol of stone by the infinite horizons could return to being the ancient Chalten Tehuelche, but I still feel that the name has been stolen again. These days voted to global tourism, when you say Chalten leaps immediately to mind now that village arose to his feet too quickly for political issues, without rules or common sense, very bad example of urban anarchy on the borderline between the pampas and desolate immense glaciers, the Great Lakes and the national park. For three long years, however, I had a part of the brain always parked on the northeast wall of Chalten, since with Fabio Leoni and Rolando Larcher we had deluded to believe in the benevolence of fate, venturing for about 500 meters along the sides of the angular part low and then, after six long and painful bivouacs in portaledge, hanging only to our hopes, suffer the inevitable "fracaso" of "Todo o Nada", driven back and invested undeservedly under avalanches from the most brutal storm that I can remember. When in the brain of a man long wags too curiosity is common knowledge that no longer need to give much advice because he knows so much wrong alone. And it happened to me to come back in the meantime two more times without great designs in the head, only attracted by the charm of those great spaces often rendered impenetrable by dense smoke storm; so perhaps the only reason I still have the benefit of the doubt not to have just totally wrong. Then I came back in December, accompanied by the enthusiasm of the first time by Fabio Giacomelli "Jas" and the timid experiences Patagonian mountains of minors Horacio Codò and Luca Fava; chalteniani doc, because of where they live, the Fitz Roy, the mountain symbol, the Patagonian giant, their myth, "tiempo feo" allowing just have it printed on the front as an eternal postcard. During the second half of December and January for most of the environmental conditions and weather there will definitely help much hope, foreshadowing another disastrous mistake. Still managed to rise in the first winter conditions almost six hundred meters of wall with the presence of a lot of snow, cracks and corners clogged with ice and plaques made ​​even more difficult and treacherous from the glass, so choosing, especially for safety reasons, to equip the way until the wide ledge of "Bivachotel Patagonicus"; which convenience of bivouac then be fundamental to overcoming the impressive succession of difficult placconate in the upper part of the wall, without ever descend. Towards the beginning of January "Jas" ends his vacation and then they must return reluctantly in Italy while with Luca I will have, even for a few days, returning to mend patiently some hope during the long waits in the "Cueva de hielo "to Paso Superior. 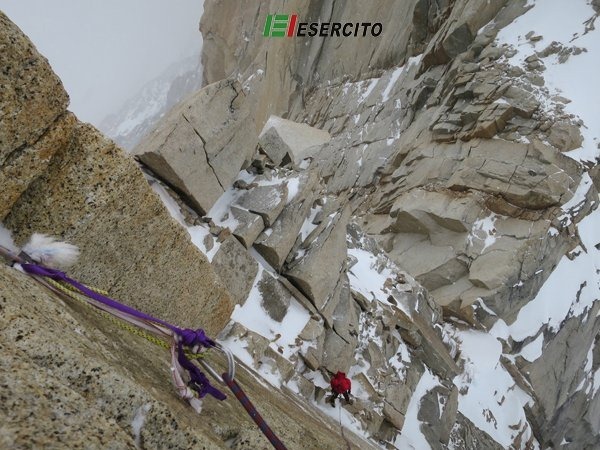 Horacio and Luke was the first time on a large wall and, having little experience, at first they did not trust even to confide that they would like to at least try to get your hands on Chalten. Looking at their immense desire in her eyes I came so naturally encourage them to embark on their first great adventure. None of us really believed in the success of the climb. We addressed from the beginning with simplicity and essential respect, without many ambitions and just have fun with the idea of climbing as high as possible. Nothing competitive spirit then, because there is nothing there to be conquered ... no heroism and no challenge, battle or war to take to anything related with victories or defeats, and the total absence of "contracts", media, sponsors and conditioning commercial. Only a true mountaineering research turned more to the recovery of the human relationship, without haste, record to beat or races that leave behind his teammates. We did not "announce" by anyone, but then quietly, slowly, things have occurred from the sun and going up we have recovered confidence, unlocking thus the brain. It rarely happens that the wind shall be softened, but even now I like to think that he has enjoyed our genuine simplicity. All our movements wanted to reach a desire but it seemed too large to express it openly. He understood and delighted us with the right time, that blue dream that deepens the sky of Patagonia. Our steps were advancing in disbelief, almost on tiptoe so as not to disturb too much the absolute silence, marking the time and days immersed in an incredible atmosphere. If it is true that in every work of genius we find the thoughts that we have discarded, going up those plaques rifuggenti that never end, we felt those thoughts now turn lost day after day in a superb line of elegance. As the tiny flea lost in that huge sea of granite climbed all day in the folds of the great mountain long imagined, then return in the evening to rest lying on the comfortable terrace in the middle of the wall above the empty, on the short line suspended almost 600 meters from the glacier, under a moon that was getting bigger. And now when in the night, tired richiudevamo the zipper of the sleeping bag against our noses, in the eye after he was impressed with the colorful magic of twilight and the pyramid of Chalten cast its long shadow far extinct highlands of Patagonia, there felt really on him the rare privilege of fate, while a myriad of thoughts mingled suspended between the bright lights of the deep and dark starry sky. In the morning, with swollen hands and fingers burned with granite, was always a thrill to share from our camp up along the first overhanging end, then, again reaccustomed the fingertips to the rock, the verticality continued to surprise us with a climb and particular in a dimension of continuous discovery. Only the side, the shape characteristic of the pillar Casarotto served as our yardstick, and there seemed to never come up to the top of the large dihedral him off by the bulk of Chalten, making it almost a unit in itself. Every corner, every corner, terrace, plaque, dihedral, fireplace or crevice, every fold, every inch of that big wall revealed a separate reality, a world in itself, almost unreal how the imagined watching from below. Then, like all the stories that end well after six bivouacs in the wall, one of which is just below the icy "cumbre" and seven days spent in the dream, we woke up suddenly at an instant from the sky to watch the whole Patagonia from the top, overlooking the charm of new horizons from infinity viewpoint Chalten. Only regret, however, remains that stone falling I hit my hand on the morning after getting off to camp again in mid-wall, on our way to retrieve the latest strings that we were not able to remove the previous evening from the top down. It seemed all of a sudden that even time had flipped. Then, during the let down towards the glacier with his right hand locked, a strange worm gnawing at me a little 'inside to see the rock finally dry and clean from snow and ice after eight days of good weather. Throughout the climb we had found conditions rather complicated, first for the presence of a lot of snow on the lower part and then, during the first four days of climbing along the upper wall, we found ourselves struggling with cracks and corners clogged with ice falls cleaning of snow accumulated during the previous long period of bad weather. Now, with the granite in that state and the knowledge of the steps, it would have been fun, after a brief recovery, try making the climb in free climbing ... but unfortunately that even small reserves of bad luck we wanted to once again put a hand ricacciandomi home with a souvenir not exactly welcome.